Oracle UPK provides a collaborative development environment to create system related assets - the "People to System" documentation. Rapidly produce materials for all phases of the software lifecycle—from test scripts, system process documents, and interactive simulations, to job aids, instructor manuals, and in-application performance support. Create engaging interactive transactional and conceptual content with enhanced sound recording, editing, and playback capabilities to enhance knowledge transfer and ensure best practices. With the ability to produce multiple outputs through a single recording session, Oracle UPK reduces content development time. Oracle UPK is key to increasing productivity and reducing overall software implementation costs. To ensure our customers have access to the best and brightest information on key industry topics, we are delivering presentations from Industry and Product Experts, Existing Customers, and Thought Leaders. State-wide unemployment offices have been overwhelmed with benefits applications. 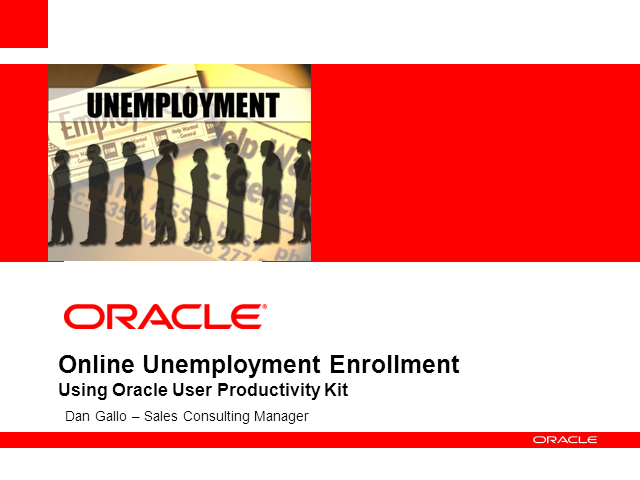 If you are managing the journey from manual paper applications to online applications, you need Oracle User Productivity Kit (UPK) to drive user productivity and increase online submissions. Oracle UPK can reduce the cost of enrollment, increase call center productivity and provides better citizen service. Listen to how other public sector organizations are using Oracle UPK. User adoption challenges are the number one reason for failed implementations. Effective users are key to the success of your enterprise software implementation or upgrade project. Learn how to create an informed user community that can be fully productive the day you go-live with your new or upgraded applications. From blueprinting/design/configuration to testing/training/go-live as well as maintenance and support, Oracle User Productivity Kit produces system process documents, test scripts, simulations, presentations, training manuals, job aids and performance support materials - all through a single authoring session with no duplication of effort. Discover how you can improve productivity, address user adoption challenges, and see the value Oracle User Productivity Kit adds throughout the upgrade project lifecycle of any application – it is more than just a training tool! How Sara Lee successfully leveraged Oracle UPK for documenting business process procedures and learning materials for strategic IT implementations. 1. Discuss Change management best practices to ensure user adoption. 2. Examine key benefits Sara Lee has realized by utilizing Oracle UPK. Transforming business is a management process that is now an everyday practice. Organizations have invested heavily in automating systems to drive their transformation projects. But, without educating end-users on how to properly use these systems, the risk of failure increases and the value of these systems diminishes. The consequences of ineffective users can lead to user errors ‘trickling up’ to become boardroom problems and the result of failed transformation projects. How do you plan to minimize costs for capturing knowledge before it leaves your organization? With the aging 76 million baby boomers approaching retirement, the problem of knowledge loss is paramount. When workers leave a company and take valuable job-related information with them, managers and co-workers are left scrambling to get new employees up to speed and keep the business moving forward. Attend this customer roundtable to hear from customers and industry experts on how you can protect process knowledge by capturing, maintaining and disseminating information before it leaves the aging and fluctuating workforce. With an easy method to document all existing processes, you can ensure best practices are leveraged and mitigate the risk of intellectual property loss. Based on a recent Gartner report, improving business processes, reducing enterprise costs, and improving workforce effectiveness are 3 of the Top 4 key CIO objectives for 2010. Many CIOs are focusing on their IT infrastructure, standardizing on tools and capitalizing on the knowledge that exists in the organization before it ‘walks out the door’ with the retiring baby boomers….and in order to meet these objectives they must ensure users understand how to use their systems…ensuring end user adoption is key. When your users know how to use your systems to do their job, they can increase productivity and profitability.